I love a good DIY! Whenever I have the opportunity to create something that will work for my kids, I do! No matter how old your child is, with a little creativity, there are many Montessori materials that can be DIYed. Today, I thought I would share 5 of my favorites for babies! 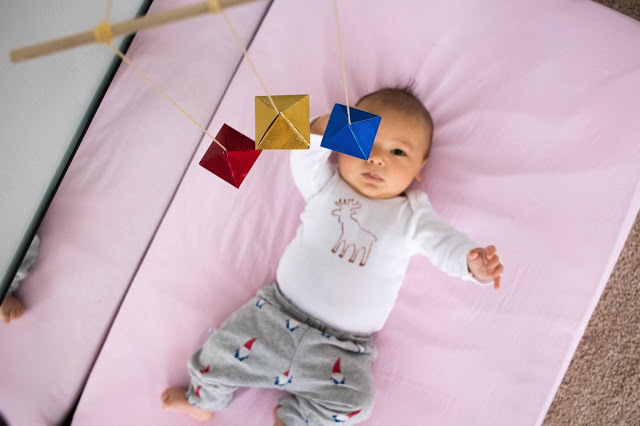 All of the Montessori visual mobiles can be DIYed but I picked the Octahedron mobile for two reasons! One, it’s the easiest (in my opinion) and cheapest to make. It’s essentially folding and gluing paper together. Two, it was a total baby-fan favorite over here! With Nora, Gus, my niece, my neighbor’s baby, all the babies, they just love the Octahedron. This is even a great DIY to tackle if you are expecting a baby! Just hang it above your baby, on a mobile hanger or play bar and let your baby enjoy! Ok, I’ll be honest here. A puzzle ball isn’t they easiest DIY out there! It requires some knowledge of sewing and some patience but once it’s done, it’s a great toy! I love it because it is so versatile. At first it can be used as a tactile mobile, hanging from a ribbon or elastic to be kicked. Then, it can be used in a baby’s hands to be passed back and forth. And, finally as a great soft ball to throw for a toddler. Here's another super easy DIY for itty bitty babies! Black and white images are a great way to provide a little visual interest in your baby's environment when your baby is first born. For the first few weeks, your baby will enjoy looking at high contrast geometric shapes. I've made these a couple of ways! I've made by painting small canvas boards with black acrylic paint. But, I've also sewn a couple versions for friends using stiffened felt sheets. Framing black and white paper can also create a nice image for baby! Each is easy to make and hang in your baby's movement area! Want to add a little order to your meal times? Your baby does! 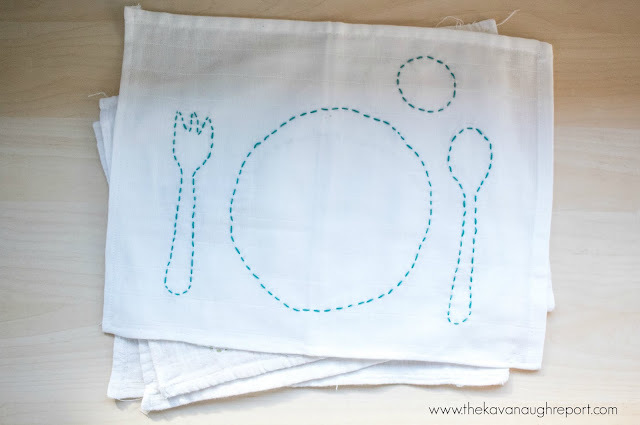 Making a simple placemat can provide order for your child on where to keep utensils/cups/plates/bowls during meal time. Eventually, your child will learn how to set the table using these placemats! These can be made in a variety of different ways. I hand sewed mine. But, I've also seen these made by sewing layers of fabric, by writing on fabric, or even just laminating paper with the placemat design. Use your creativity here to make one that works best for your family. Here's a DIY for your older baby! This has been a favorite of my children well into toddlerhood. 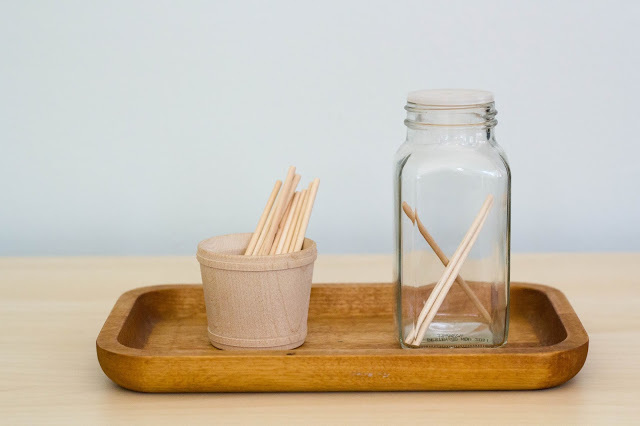 This is as simple as finding a spice jar and some small sticks (can be craft sticks, q-tips, or sucker sticks). Organize the tray and set your baby free! Its great fine motor work and many babies love this kind of posting work. 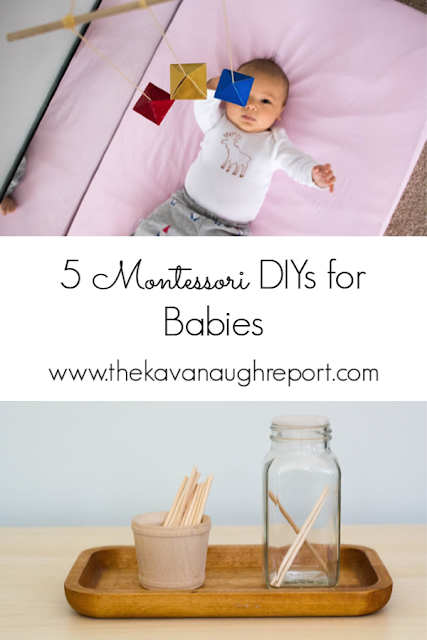 Do you have a favorite Montessori baby DIY? !